RETUrN Learning Community: General science and introductory sociology curriculum thematically linked using a Superfund site undergoing redevelopment. For our first linked classes, we as instructors had learning outcomes in mind for our students. 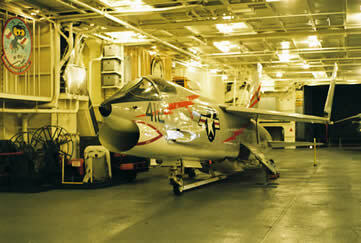 Navy Jet inside the U.S.S. Hornet Naval Aircraft Carrier (retired) which is docked at Alameda Point. Urban Environmental Issues course has both a lecture/discussion and laboratory component.